The thing about irresponsible people showing off and crashing at car shows is that end up getting the event cancelled. That's not right. The best case scenario is that only the driver's ego gets a direct hit. Hooning simply takes practice, but remember to limit that to an empty parking lot. Otherwise, you'll end up on YouTube, and possibly make it here as well. So many bros, so little IQ. Somebody please explain to me what went on in his mind. Might be worth a full-length feature movie. Losing one wheel means somebody made a mistake. Losing all four means you're an idiot. Fail during a PR event is the best sort of fail. It's called a gravel trap for a reason. 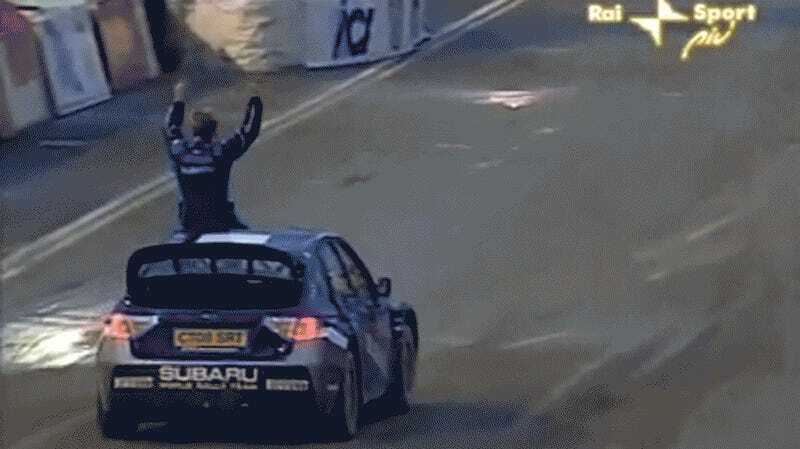 Here's WRC world champion Petter Solberg showing off how ghostriding can go wrong at a demonstration event. You should never have to run after your car. Even in kit car form, the Cobra is not for beginners. It's not okay, darling. A quick burnout is a nice way to heat your tires and make you feel good about yourself. A too long one ruins your Camaro in front of your buddies. It's embarrassing. Car shows for the rich and famous are still car shows. This Ferrari might cost you millions of dollars, but the brakes are still far from being carbon ceramics. There is such a thing as having too much car.